The Mariandale Center’s meadows, trails, and woods offer our visitors room to wander and open spaces for contemplation. Our guests enjoy the serenity of the grounds and their healing benefits. There is a Nature Trail that runs along the perimeter of the Center’s grounds, high above the Hudson River, with a stunning view of the river and valley. Along the Nature Trail, visit the Healing Hut, the gardens, and the many trees planted in memory of our friends and loved ones. The 7-circuit classical labyrinth at The Mariandale Center is situated at the edge of a peaceful wooded area near the Hudson River. Its location offers the opportunity for a highly sensate, reflective prayer experience to those who walk its path. This single alternating (clockwise-counterclockwise) pathway leads journeyers in a quiet, calming, intuitive way toward the center for a meditative pause, allowing the Divine Spirit to enlighten them. They then retrace the path in reverse. There are benches nearby to sit on for continued prayerful reflection on one’s experience. There is a portable canvas labyrinth of the same design available for indoor use by our guests. The word labyrinth means an intricate network of winding paths. There are many diverse designs. The 7-circuit classical is constructed from a cruciform. It is an archetypal symbol of the life/spiritual journey, a trust walk in search of the inner true self or the Divine and a renewed understanding of life’s meaning and purpose. Labyrinths have been used in every world culture and religious tradition for over 4,000 years. There is no “right” or “wrong” way to walk the labyrinth. It is suggested that one prepare for the walk by quieting the mind and opening the heart. You may want to see the walk as three parts of a whole experience. The entrance can be a place to breathe deeply, focus on a mantra or desire for spiritual growth. This beginning of the walk is an opportunity to “let go” release; quieting of thought, worries, lists of tasks to do. Arrival at the center circle is an opportunity to open oneself to receiving “letting in” God’s guidance, consolation or challenge. When ready, the walk out is a “letting out” an integration that takes us back into our lives empowered by the Spirit to share the transformed insights we have received. Some people have profound insights, others small ones or none at all. The experience is different for each person each time. Whatever you experience, it is your experience. Relax and see what happens. 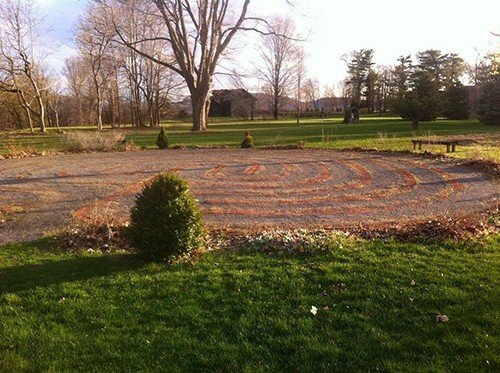 In many ways the labyrinth can be seen as a call to action, a transforming tool for healing, releasing grief, making decisions, a coming “home” to our own center and an empowerment to announce God to the world. The Healing Hut was designed by David Robinson, founder of Natural Edge, and former director of Restoration for Central Park in New York City. The juniper wood to make the Hut was hand chosen by David and during the process the wood was endowed through prayer, with healing properties, so that all who enter may receive blessings. The hut was purchased by friends as a memorial for Sr. Maureen Michael Bergin, OP, a Dominican Sister of Hope who devoted her life to healing and hope for the poor. “To maintain emotional health and tranquility, we all need to take time out from the bustle of daily life to nurture the soul. Experience the serenity of nature. 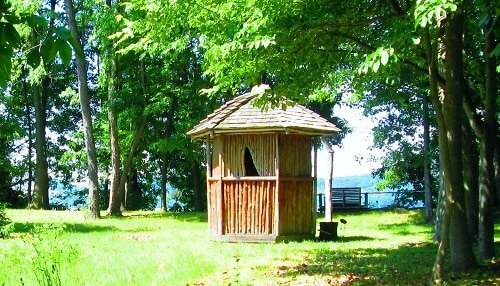 Make your way to the healing hut on the trail along the Hudson. Go inside and sit awhile. Be conscious of your breathing as you sit. With every breath you take in, you share in the life of the universe. With every breath, you will share in the life of those who have sat where you are and desired healing. With every breath, you share in the life of those who will come after you. The Nature Trail winds along the perimeter of the Mariandale grounds, along the cliff high above the Hudson River, with some of the loveliest views. You can see the incredible Hudson River sunsets from the trail. Benches along the way provide privacy and space for reflection. The trees, in every season, frame these lovely views and offer a unique perspective.